The R domain of CFTR is encoded by exon 13 and it spans the region between NBF1 and the second transmembrane region. It contains several potential sites for phosphorylation by cAMP dependent PKA or PKC. 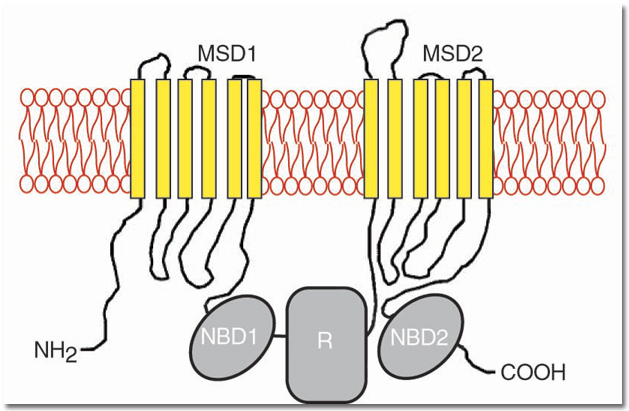 The activity of CFTR as an ion channel depends upon phosphorylation of the R domain and binding of ATP to the nuclear binding domains. The N terminal portion of the R domain (RD1) is highly conserved between species but there is a lower degree of conservation between the rest of the domain (RD2). c.1972_1973insA p.Arg658LysfsX7 2104insA+ 2109- 2118del10 exon 14 insertion of A at 2104, deletion of 10bp at 2109 ? c.2280G>A 2412G/A exon 14 G to A at 2412 Sequence variation? c.2619G>A 2751G- >A exon 15 G to A at 2751 mRNA splicing defect?